On the past December 13th 2016, it took place the final project meeting. The meeting was held at the facilities of partner Joanneum Research, where all partners had the opportunity to present a summary of the main conclusions and achievements. In addition to the Project Meeting, a demonstration event was organized at the facilities of partner Saubermacher. The demonstration included a visit to Saubermacher’s production site, as well as a number of tests performed with metal scrap samples, in which it was possible to assess the effectiveness of the technology developed during the ShredderSort Project. 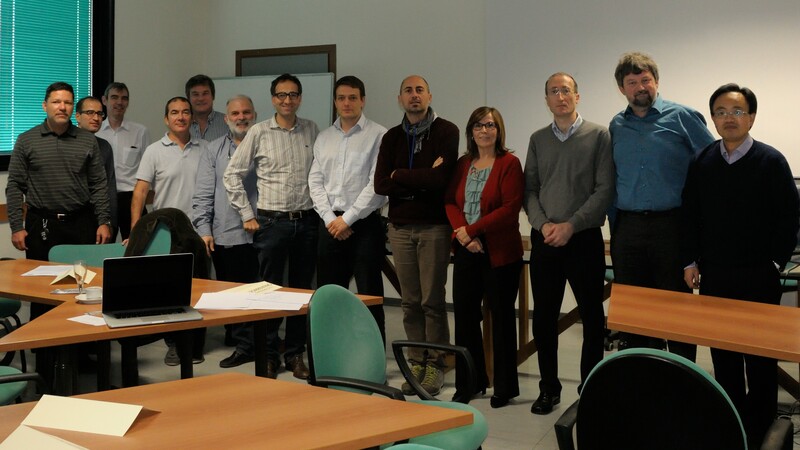 The SHREDDERSORT 27 month general and project review meeting was held on the 7th and 8th of April 2016 in Castelldefels (Barcelona), kindly hosted by project partner REGULATOR-CETRISA with all partners attending. The review meeting was held day on Day 2 in the presence of independent experts in Laser Induced Breakdown Spectroscopy (LIBS); and magnetic induction, and with the project officer, who all reviewed the progress to date. 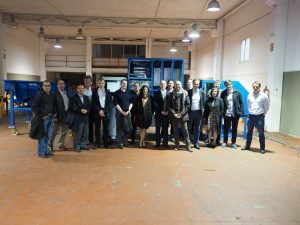 As part of the meeting on Day 2, the project partners and the independent experts visited CERTISA’s facilities for a demonstration of the operational High Throughput LIBS (HT-LIBS) sorting line. In that system, cast aluminium (Al), wrought Al and non-Al metal fragments travel on a 1 m wide conveyor at a speed of 2 meters per second, with a target throughput of 1 tonne per hour. In LIBS, a short, high power laser pulse is focussed onto the each of the metal fragments as they pass by, which ablates a small mass from the surface of the fragment and generates a plasma plume with temperatures in excess of 100,000 °C. As the plasma cools, the characteristic emission lines of elements in the ablated material are measured using a high speed spectrometer, to distinguish between the different Al alloys prior to separation into 3 classes by air ejectors. 80% of the HT-LIBS sorting line functionality was demonstrated in situ, with remaining aspects integrated within 2 weeks following the meeting, and shown to the reviewers in the form of a video. The remaining two sorting systems: i) EMTS+VIA, based on magnetic induction and machine vision sorting methods, and ii) High Performance (HP-LIBS), will be operational by September 2016, prior to the validation of all three systems in commercial shredder plants from Oct-Dec 2016. The SHREDDERSORT 18 month general meeting was held on 22 and 23 of July 2015 at the Lenz Instruments, hosted by coordinator company Lenz Instruments. The consortium presented and discussed the progress made since the M12 meeting, and the actions for the next period. Project management and dissemination issues were also discussed. Presentation of the new dual-pulse laser module developed by Monocrom, which provides higher pulse energy than the first laser prototype. Description of the high-speed polychromator, and scanning optics, developed by Lenz Instruments. Demo at LENZ: A demonstration of the high-speed LIBS polychromator is performed at Lenz’s optical laboratory. In the demonstration it is shown the ability of the system to discriminate between cast and wrought aluminum. Management & Dissemination issues: already undertaken and pending dissemination actions are reviewed by the Coordinator in order to help the drafting of the Plan for the Use and Dissemination of the Foreground. Doubts about the financial reporting are solved and each partner’s Use of Resources reviewed. The next general meeting has not been scheduled yet, as it shall be coordinated with the date for the review meeting. In the meanwhile, specific and reduced technical meeting will be held (both by conference call and at some partners’ premises). 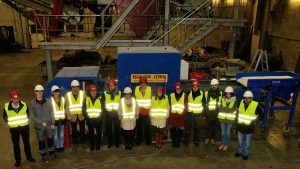 Instituto Superior Técnico (IST) and Laboratório Nacional de Energia e Geologia (LNEG): update and conclusions of the physical and chemical characterisation of shredder scrap. This information been used in the detailed design of the novel sorting processes in the project. The characterisation work package is now complete. Centro Nazionale di Ricerca (CNR): results of Laser Induced Breakdown Spectroscopy (LIBS) analysis of shredder scrap samples, along with algorithms to enable separation of cast and wrought aluminium, and concepts to allow optimization of the laser design. Monocrom: design details and results of their compact, solid-state, laser development for LIBS. They are exploring various options for the laser design, and will shortly settle upon the best design for the LIBS sorting systems, and manufacture prototype lasers for integration and test. Lenz Instruments: presented the design of their high sensitivity, high throughput LIBS spectrometer and signal processing electronics, with the manufacture of components underway. Marwan Technology: details and results of an alternative optical method to gather the LIBS emission from the metal scrap samples. University of Manchester: showed results of simulations and tests for the electromagnetic tensor spectroscopy (EMTS) method to be used for separation of aluminium, brass/bronze, and copper. They showed the built induction coils and the configuration they have designed for the system. Tests will soon begin with these coils and associated electronics on a small test conveyor in the UoM laboratory. The test setup was shown and explained to partners in a tour of the lab. Lenz also gave details of their development of the signal processing electronics for the EMTS system. Jonneum Research: further results of their 2.5D vision system which provides position and shape information about the scrap pieces for the downstream sorting systems. They presented a proposal for integration of the vision system with the EMTS system. The industrial partners CETRISA and Saubermacher provided recommendations from the perspective of system integrator and end-user respectively. The 18M general meeting was tentatively scheduled for the period 22-24 July 2015 in Barcelona, immediately following the MMME’15 2nd International Conference on Mining, Material and Metallurgical Engineering in Barcelona, which some of the partners will attend. Instituto Superior Técnico (IST) and Laboratório Nacional de Energia e Geologia (LNEG): results of physical and chemical characterisation of shredder scrap, as inputs for the design of the novel sorting processes. CNR: results of Laser Induced Breakdown Spectroscopy (LIBS) analysis of shredder scrap samples, along with algorithms to enable separation of cast and wrought aluminium. Monocrom: results of their compact, solid-state, dual-pulse laser development for LIBS. Lenz Instruments: results their development of the high sensitivity, high throughput LIBS spectrometer and signal processing electronics. Marwan Technology: results of an alternative optical method to gather the LIBS emission from the metal scrap samples. University of Manchester: design and simulation results for the unique coils to be used in the electromagnetic tensor spectroscopy (EMTS) system to enable separation of aluminium, brass/bronze, and copper. Jonneum Research: results of their linescan vision system which provides position and shape information about the scrap pieces for the downstream sorting systems. The industrial partners CETRISA and Saubermacher provided recommendations from the perspective of system integrator and end-user respectively. Unfortunately end-user partner DIEZ could not attend this meeting. CNR conducted a tour of their facilities, including a demonstration in their LIBS laboratory with Marwan’s Modì – transportable dual pulse LIBS instrument, on aluminium, copper and iron samples. We look forward to seeing all partners again at the 12 month general meeting scheduled for mid-February 2015 in Manchester UK, hosted by the University of Manchester. 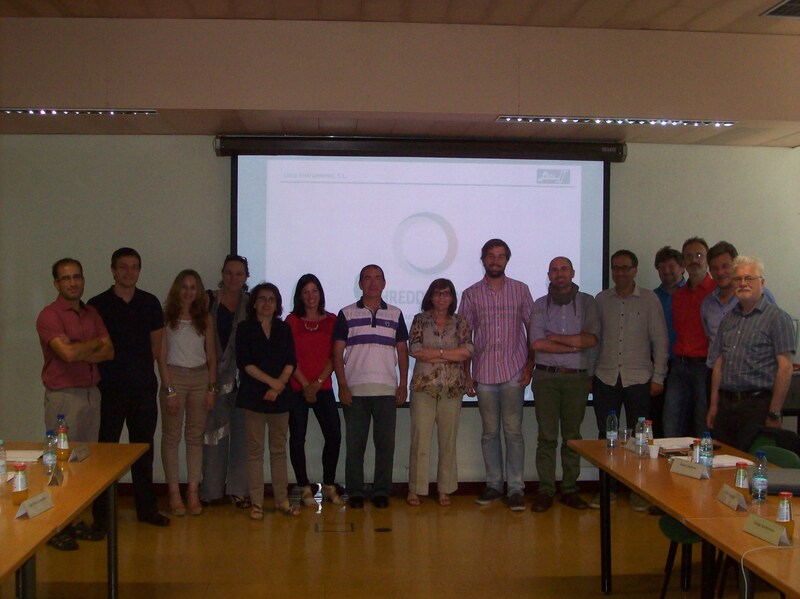 The SHREDDERSORT, M6 general meeting was held on 9-10 July 2014 in Lisbon, Portugal, kindly hosted by partner, Instituto Superior Técnico (IST). IST and LNEG presented the results of characterization of shredder samples supplied by end user partners SAUBER and DIEZ, as part of Work Package 1. UoM, JR, CNR, MCROM, and LENZ each presented the progress made in WP2 to WP6 respectively. Project Management issues and dissemination issues were also covered. Discussions took place following each presentation, and agreements were made on the priorities for each WP going forward. The next project meeting (M9 technical meeting) is scheduled for mid to late October 2014, at Consiglio Nazionale delle Ricerche (CNR) in Pisa, Italy. We wish all partners a pleasant summer break! 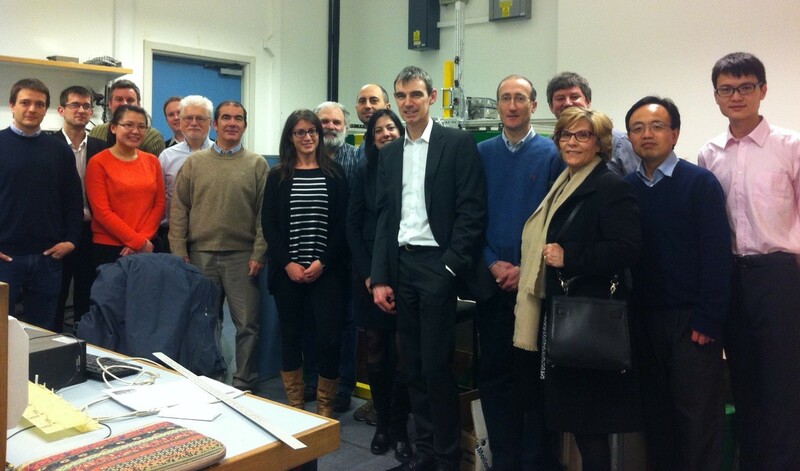 On 15th and 16th January 2014, the SHREDDERSORT project was officially launched with the Kick-off meeting kindly hosted by MONOCROM S.L., in Vilanova de la Geltrú (Barcelona). The 2-days meeting turned out as an excellent opportunity for the Consortium members to know each other personally and start working on the first project tasks. Technical details, so as financial and administrative issues were presented by the Coordinator, LENZ INSTRUMENTS, and discussion and planning of the first project activities started.